Intermediate bulk containers (IBC) are used for the transporting and storage of liquid and granulate bulk materials. 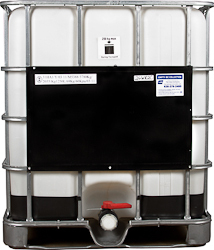 UN rated 31HA1/Y, our 275 gallon totes are available rebottled with a reconditioned metal cage or with a new bottle and cage. The tote has a 6" lid opening, with cap. Valve options: NPT ball valve or camlock. Please e-mail us for pricing.